Hi Janice. I didn't mean to discourage you but all the electronics and capacitors and bridge rectifiers can be confusing. Yes, cap is lingo for capacitor. Sometimes they don't appear bad and the only thing that truly tests them is called an ESR meter that not many people have, good thing is they're cheap and easiest to just swap out if you have concerns, same for the bridge rectifier. You can check the bridge by putting your meter in diode test (looks like an arrow >| kinda. Meter back and forth across the terminals and note a beep and any of the positions. Without seeing the schematic I would think there would be one main power supply and there would be another totally separate for the motor control. This would be somewhat smaller and have an IC (integrated circuit) on it or a large transistor that regulates the motor speed. I am new (as of last week ) to projectors but have fixed many reel to reel tape machines that employ the same electronics to regulate motor speed. Like I mentioned, when you arched your test leads and got the sparks testing your motor.... the mains fuse likely went killing all the subsequent circuits. You have to get the machine back to pre zap state before you can figure out the motor issue. Whatever fuse lays just inside near where the power cord comes into the unit will be the mains fuse. Swap that out, hit the switch and see if your pilot like at least lights up now. Keep me posted. Someone with your expertise will be greatly appreciated. Thanks PatD. I went back through some of the posts and I see lots of what I said had been looked at already. Fresh set of eyes and perspective never hurts. While I'm thinking about it. Janice, try getting your parts from Digikey, I dealt with them lots and they always had the odd stuff I was looking for. One old trick is to just use your nose.... don't get too close and just sniff around the area in question to see if you smell anything burnt. also, gently tapping any area with components with the plastic part of a screwdriver sometimes shows up bad solder joints that may be the problem. Your testing always starts something like this, cord, mains fuse, power switch then move on to the first board the wires from the switch go to metering all on the AC position and range on your meter set to "200". when you start seeing caps and diodes switch to DC position in the 20 position likely. Your meter will tell you if you're out of range. Keep us posted. I have no idea the inside of your machine but I'm a troubleshooter. Craig, I realize this is a long thread and if you haven't read thru each step it can get confusing. Here's a bit of a summary to get up to what we know and where we are to date. 1. The motor is good. 2. The transformer is bad. I bought and received a replacement transformer. 3. There are 2 areas where the PCB traces are burned out...one on the top speed/audio board and one on the larger lower board effecting power to the motor. 4. I early on shorted something out on the speed board while attempting to meter the Bridge Rectifier. This knocked out the audio. 5. The lamp still works. 6. Despite popular opinion....There are NO FUSES that I can find in this projector. 1. 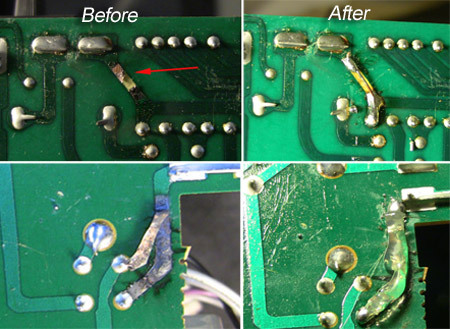 Repair traces on the 2 PCBs. 2. Replace the existing wire with a fuse holder and fuse on the speed board. 3. Replace the Bridge Rectifier. I only have one word. Wow! I wish you the best of luck. Transformer was bad? just want to check with you, are you sure your meter was on ac and not dc? and that you were measuring across the the centre tap to any of the leads on the secondary? I don't want to stir things and I just want to help. But power transformers don't usually go, especially ones from that era. Never say never but.......let me know how you make out. Having said that if there were no fuses in the unit it could happen, it's just the DC side usually melts quickest and after it blows the main part stays on. I think you have a handle on things. Always probe circuits with one hand. my part of the world. Good luck. Bruce if you click on the link I posted for the fuse holder you will see they are clips. I was just using the term "fuse holder" as a generic reference for the part and the term I used in my internet search. 6. Get rid of projector. PatD, you are thinking the way I'm thinking. I hate to say it but it's not worth the effort, time or money. Sorry. Tough pill to swallow but I have been there more than a few times. I personally would repurpose it as a telecine setup, you have a nice motor and the mechanics still work, and that motor is easily speed controlled down to 1 or 2 fps just by dropping the voltage. I look at trying to repair it as a fun adventure/learning exercise, it would probably be less hassle to buy a mechanically broken 800 and swap out the boards. There has been many a time I have whiled away far too many nights repairing something I probably should have thrown out, but I enjoyed the journey and learned a bit along the way, so it was (kind of) worth it in the end. I'm going to ignore Pat and Craig's posts because they are non-constructive. It's my time and my money so why not be supportive. None of the things listed on the repair list is beyond doing. I'm currently talking with a former co-worker who is interested in helping me and Pete has been very generous with his time to help troubleshoot the issues. He obviously wouldn't be doing this if he didn't feel it was worth the effort. So please...you may personally think this is a futile project, but maybe refrain from such defeating comments. I am with you, Janice. A French site recommand not to transform projectors in telecine as if too many people do so there won't be projectors left for the next generations to project reel films. Saying that, they value each projector. I think also that each projector wich can be fixed or kept well working should be, even if it is easier or cheaper to thrown it away and buy another one. You get my full support on this project, Janice. Hello all. I agree 100 % with Dominique. Please, Janice, do not give up!!!! I've seen projectors which were in a stae worse than this one's, which were brought to 100% efficiency. So don't give up. You can do it. Sorry, I didn't mean to be defeating. If you and the people helping have any electronic based questions feel free to ask. I retired from that now but I can shed insight on older electronics. Janice, I repair a lot of computers and to expound on identifing bad caps you need to look for swollen and leaking caps. If you see any bulging of the capacitor body, or any black or brown "crud" on the component, then it is probably bad. Ironically, I see this on motherboards quite a bit, and the computer still works, but will usually fail within a short period of time. Also, be sure to disconned the AC and discharge any caps that you will be working on, or around. They do "bite"! Is it me Janice or is your 800 expoericing similar issues to our 600's? Peter from Australia, do you mind asking me where in Australia you are, I am in Melb Northern Suburbs. as maybe you know more about this than I or know someone in Melb who can check this sort of thing. You can MSg me if you like, I have a 600 that just stopped running, I am hoping it was where the brushes connect to motor as I noticed a spring was missing for white cable and a bit of dust and fluff came out. Got some new springs, brushes look okay, but going to have to wait for a mate of mine who has smaller hands and not effected by arthrtis to put them back on again. The blue and white wire does have power according to my meter. Although I don't really have any good news to add to this thread...I thought I would update this saga with my recent activities. I did the repairs to the two PCB's which came out fine. After the repairs... I re-inserted the speed board and re-attached all the connections...so far so good. But then I plugged in the power cord...OH NO...some obnoxious smoke started bellowing out of the machine. Didn't seem to be coming from anything in the area of my repairs. Pulled the plug...tried not to breath in the fumes... and got out of the room. Some air freshener helped with the horrible smell...but nothing seems to be helping my poor projector. To say the least....I'm a bit discouraged at this point. Regarding purchases from Ebay, persons that sell films truly may not know much about them. They may have purchased them at a sale and are just reselling them. Projectors however, are a bit different. Most anybody can plug them in and if they hear the motor/fan running and if the lamp lights, they assume it is working just fine and may state as much in the ebay ad. It is incumbent on anyone purchasing a projector to ask questions. I always ask if it has been tested with film. If it is a sound machine I ask if has been tested with sound film. If not tested with film do the sprockets and reel spindles spin as they should in forward and reverse. I ask if there is any sound from the amp and/or speaker when the volume and tone are adjusted up. If you don't ask these questions, you are really rolling the dice on an Ebay purchase. Based on the problems Janice has found with her projector, that seller clearly knew it did not work properly. Read the thread from start to finish. Thrilling!!! Sorry Janice how much trouble this has been. If the original ebay advert said it powered on, yet the lights and spindles didn't work...I would, like you, think it was an easy fix. Did you get the new transformer?? Thanks guys for the comments. At this point I've pretty much put the whole Ebay transaction scenerio behind me. Live and learn... and I have learned a lot. I had never done any soldering before or used a multimeter. Now I have done both and it was fun. I still don't understand much about electronics...but I know enough now to ask better questions from the experts here. Matt, I do have a new transformer, which I haven't installed yet. I was waiting to repair the PCB's which I've done. However, the recent incident with the smoke has made me reluctant to move on. I also wanted to replace the Bridge Rectifier and it's adjacent capacitor. The capacitor I can get easily...but the bridge rectifier is a mystery. I don't have a clue to what I can use to replace it. I'm like you..just dabble here and there with a multimeter, but really don't know enough about it to be totally confident. I think what you need going forward, before turning on any more power etc...is, once the pcb is fixed and then replace the bridge rectifier, find out from the gurus here what order you can safely turn things back on, so as not to re-fry anything. The last thing you want is to blow that new transformer(if that is possible). I am more worried about your safety of course! So far you are doing good. The fact that Pete even blew a fuse, and he knows what he is doing, shows how easy it is to mess up.... Such a scarey project, but i agree- FUN!! I will watch in anticipation as well...with popcorn in hand... Here in Canada, Radio Shack is now 'The Source' which i nowhere as good as radioshack used to be here, but they used to carry rectifiers and such. I am sure someone here will have an extra one that will work for you! Joe...You are making me blush AGAIN. A photo on a T-Shirt... possibly, but a gold bikini...OMG...I don't think you want to see that Let's just leave it up to your imagination and so will I. I'm glad we can have some fun in the midst of utter disappointment in working on this projector. I'm glad I was able to make you smile and dissipate some of your frustration!